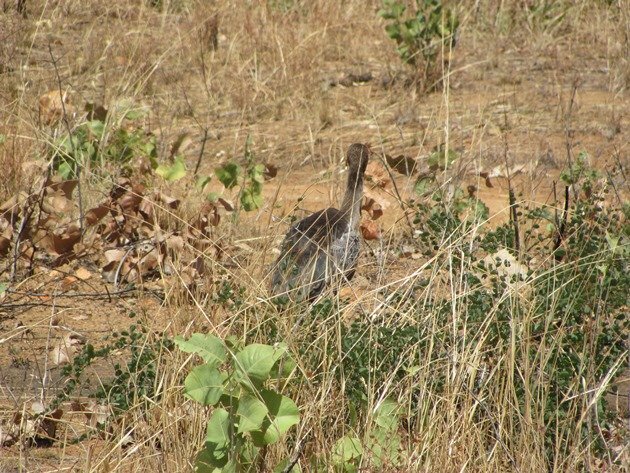 On our recent camping and birding trip to the north of Broome we had an odd experience. 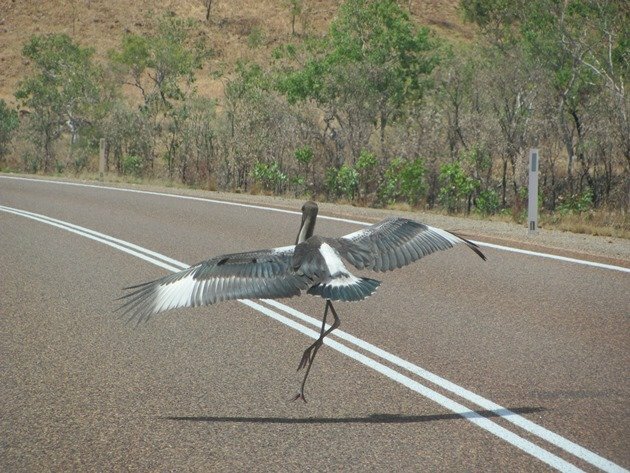 We were driving along a windy section of the Great Northern Highway north of Warmun in the Kimberley when I suddenly called out “Jabiru stood on the road”. 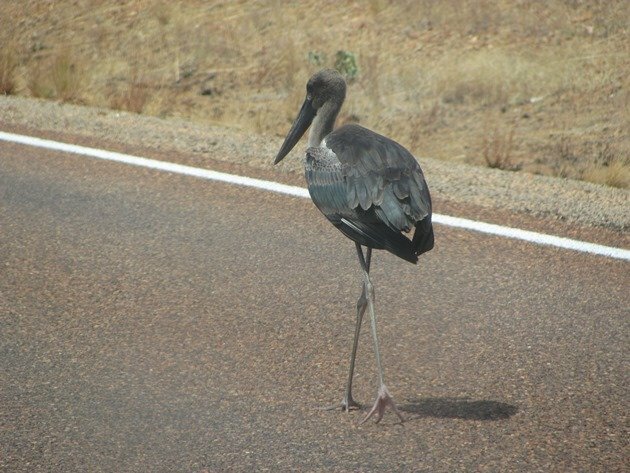 Grant immediately braked as we came around the corner and right on the double white lines was a young Black-necked Stork. 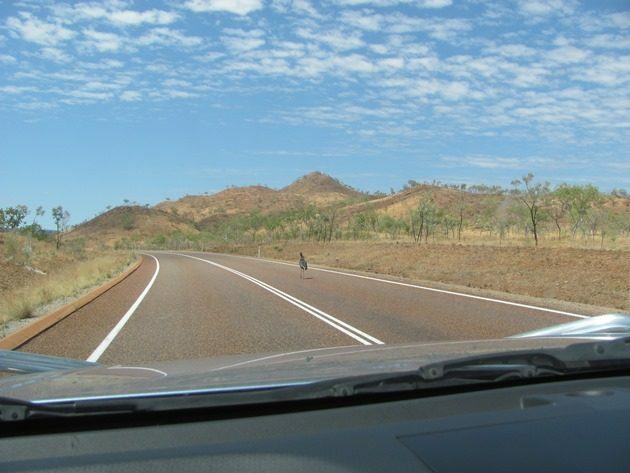 Thankfully the Great Northern Highway was not particularly busy at that time in the middle of the day and we could slow down and try and convince it to get off the road. 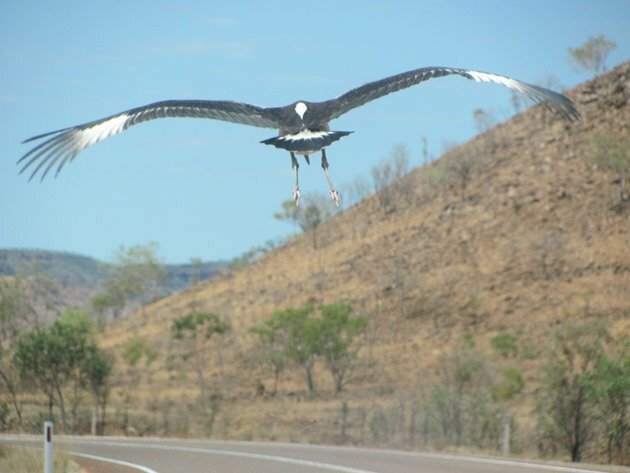 It had possibly been in flight looking for water and got confused by the bitumen mistaking it for a windy river. I had my camera handy and took several photos through the windscreen as we tried to slowly convince it to leave the highway. 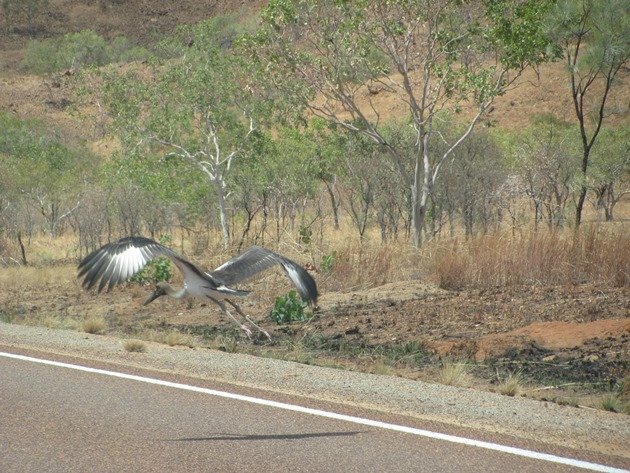 Eventually we convinced it to take off again, but there was no shade and nowhere for it to get away from the highway further ahead. We then decided that we had to go ahead to get beyond the double white lines and turn around and convince it back the other way! 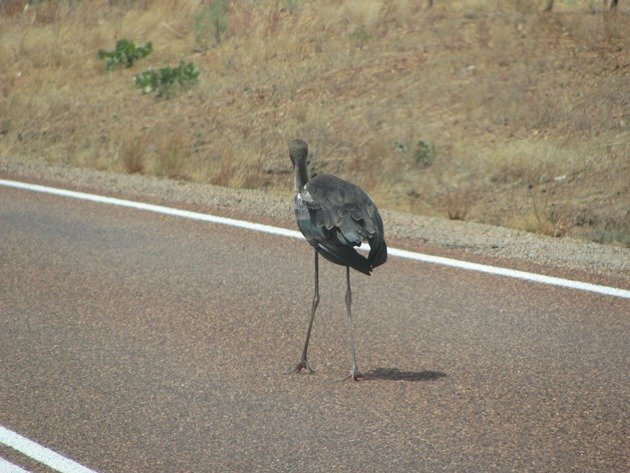 Trying to convince a Black-necked Stork off the highway! 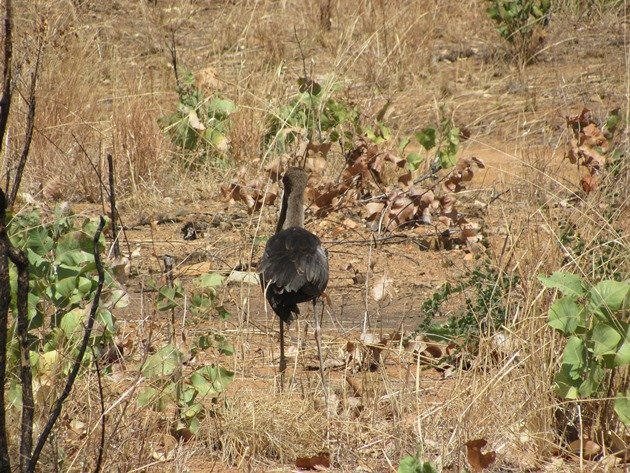 We were eventually able to get the Black-necked Stork back along the highway with some gentle persuasion and it landed closer to a suitable shaded area in the bush. 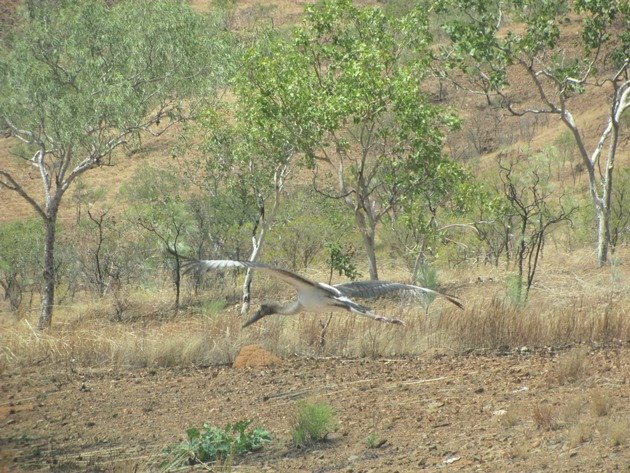 The Black-necked Stork wandered into the bush and we hope that it stayed off the Great Northern Highway and after some rest worked out where it needed to be to find a suitable habitat. It was extremely lucky that during this whole episode that took several minutes of driving backwards and forwards over about one and a half kilometres that there was no other traffic to contend with! 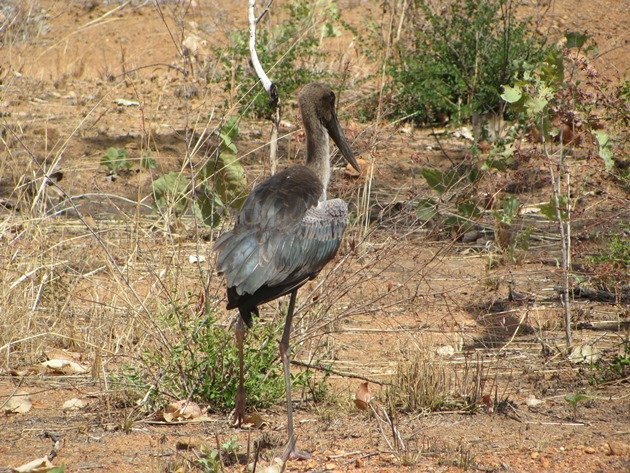 Hopefully the Black-necked Stork is now settled in somewhere well away from the Great Northern Highway. Poor little Black Stork. 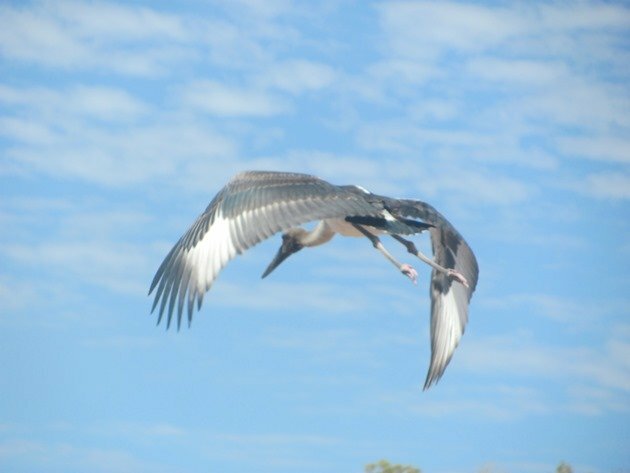 That’s a different kind of birding adventure! Yes, poor stork. But what a heck of a great experience!! !